Daimler CEO Dieter Zetsche: "I was convinced we were at the beginning of an upward trend. We're seeing clear signs of that now, and there's more to come." FRANKFURT (Bloomberg) -- Daimler AG CEO Dieter Zetsche in early 2013 had to face down critics to hang onto his job. A year later, his strategy is gaining traction, with Mercedes-Benz closing the gap with bigger German rivals. 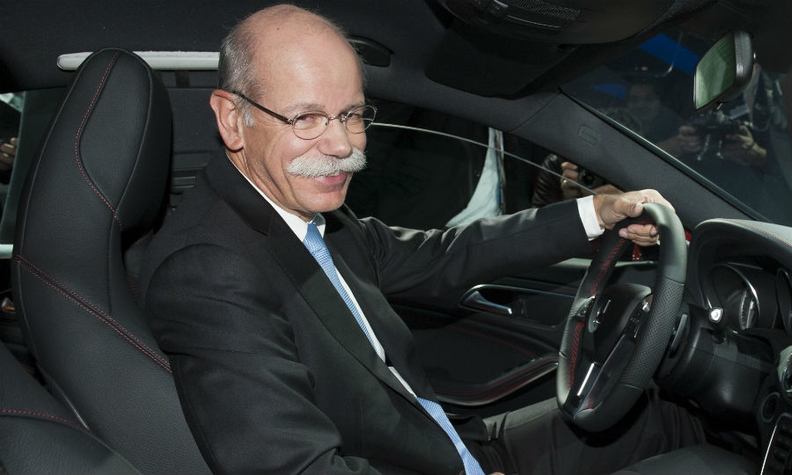 Zetsche's term was extended last February by two years less than the norm in Germany, after investors and labor leaders resisted giving him a full contract following a series of profit warnings and years of sluggish gains at the world's third-largest luxury car brand. The CEO was also pushed by unions to swap two of his top lieutenants as part of the deal. His fortunes have changed considerably since then. Mercedes, boosted by the new entry-level CLA-class sedan, outsold Audi in the final months of 2013 and grew at a faster rate for the year than BMW for the first time since 2010. This year, a revamped S class will be fully available, and a refurbished C class, its best-selling model, begins hitting showrooms. Mercedes will also introduce the GLA compact SUV in 2014. "The criticism last year wasn't completely unexpected, but it was based on conditions that were rooted in the past," Zetsche, 60, said in an interview with Bloomberg News. "I was convinced we were at the beginning of an upward trend. We're seeing clear signs of that now, and there's more to come." The latest signs of progress are expected Thursday when Daimler releases fourth-quarter results. Earnings before interest and taxes from ongoing operations are forecast to gain 37 percent to 2.39 billion euros ($3.23 billion), according to the average estimate of 12 analysts surveyed by Bloomberg. The stock has climbed 43 percent in the last year, valuing the company at 64.9 billion euros. Zetsche has vowed to retake the lead in luxury-car sales by the end of the decade after dropping behind BMW in 2005. The pledge was made in 2011, the year the brand, which traces its roots to the first car in 1886, also fell behind Audi. Mercedes' deliveries grew 11 percent in 2013, compared with Audi's 8.3 percent increase and the BMW brand's 7.5 percent advance. "The 2020 goal is not completely unattainable for Mercedes-Benz, but BMW is very successful and makes a lot of the right decisions," said Juergen Pieper, a Frankfurt-based analyst with Bankhaus Metzler. "BMW has quite an edge over Mercedes-Benz and will do a lot to retain the leadership." Zetsche, who spent much of his eight-year tenure as CEO shedding businesses, including unwinding the merger with Chrysler, exiting a holding in Airbus Group NV and shuttering the Maybach marque, is more free as a result to focus now on Mercedes. His efforts reached a turning point in May when the redesigned S class made its debut on a rain-soaked airfield in Hamburg, under a shower of fireworks and accompanied by singer Alicia Keys and an 18-member orchestra. "Dieter is a remarkable engineer and business leader," said Tom LaSorda, who was Chrysler's COO when Zetsche ran Chrysler and has since worked with auto dealer Penske Automotive Group Inc.
Zetsche "knows as much about design and product development as he does finance, which is a rare combination." Zetsche was heavily involved in the remake of the automaker's flagship sedan, including pushing for a reclining rear executive seat that offered unique comforts such as a hot-stone massage function. The U.K.'s Top Gear magazine proclaimed the new S class as "unquestionably the world's best luxury car." "This is my vision of Mercedes-Benz -- the best or nothing," Zetsche said in last month's interview with Bloomberg. "Demands on a brand like Mercedes-Benz are always going to be high. We can't say average is OK."
The challenge for the 38-year Daimler veteran will be to close the sales gap as BMW and Audi react, while also hitting a profit-margin target of 10 percent at Mercedes. The unit's margin in the third quarter was 7 percent. The goal was originally supposed to have been met in 2010 and has since been postponed indefinitely. He also needs to keep operations running smoothly after Andreas Renschler, head of Mercedes production and purchasing, quit unexpectedly last week. Zetsche, who runs the Mercedes-Benz Cars unit alongside his role as the manufacturer's CEO, just started his latest three-year contract. It was due to be five years before employee representatives, worried about cost-cutting measures at Mercedes, threatened to block board approval. Works council members hold half of the seats on the controlling body of publicly traded companies in Germany. That forced Chairman Manfred Bischoff to offer a shorter deal and put trucks chief Renschler, 55, in charge of operations in place of Wolfgang Bernhard, who had strained relations with labor leaders in the past. Renschler last week was replaced by Markus Schaefer, 48, who was responsible for production planning at Mercedes. Schaefer is the fourth operations chief at Mercedes in the last five years, after Bernhard replaced Rainer Schmueckle in 2010. There's no consensus that Zetsche can return Mercedes to the top seller of luxury cars. IHS Automotive, a leading forecaster, predicts that the brand will drop back down to third in 2016 after regaining the No. 2 spot in 2015. By 2020, rather than beating BMW, IHS expects Mercedes' sales gap to widen to more than 300,000 vehicles from 216,000 this year. "Even if the second half of 2013 showed sales growth and probably an earnings increase, Mercedes is still lagging behind the competition," said Marc-Rene Tonn, a Hamburg-based analyst with M.M. Warburg Research. "It takes much more than a good year to assess if a new strategy is successful but the direction seems right at the moment." Zetsche said the results of decisions made during his early days as CEO, in an industry where developing a new vehicle can take seven years, are just now bearing fruit. One of Zetsche's bolder decisions was in 2008 when he named Gorden Wagener, who turned 40 that year, as head of design, succeeding Peter Pfeiffer, a Daimler veteran of 40 years. Wagener has refreshed Mercedes, making it more sporty to appeal to younger customers. "The brand no longer only rests on comfort and elegance but has added other values, such as a more dynamic design, to address younger customers," said Stefan Bratzel, director of the Center of Automotive Management at the University of Applied Sciences in Bergisch Gladbach, Germany.